Wow this is a oldie, this was one of my early projects in my quest for the diploma, with the uninspiring task of taking pictures of white things. Wasn’t my choice in categories rather the suggestion of a uninspiring professor who disappeared from the college not long after that semester. He was a great photographer, but sadly couldn’t handle the need of our class that I ended up teaching to the newbies of photography. So you find me in my back garden in NJ with the contense of the “plastic fantastic” kitchen cupboard scattered on where the lawn should be. Just for the record, non of that cutlery has every been used and is now neatly decorating the tree outside the front door along with tin foil balls and Easter eggs, trust me, it looks pretty. Since this was taken, there has been more snow you can shake a stick at, hurricane Irene that stole two of the older trees at the back, deer and bear and many other creatures walk across it eating my plants and I have so many ideas of it that i just do not know where to start apart from with the grand suggestions of the she goddess Pinterest herself. I love my garden and I cannot wait to have a picnic there as soon as I get back to that side of the pond. This entry was posted in Pretending to be a pro photographer. and tagged garden, Photography, picnic, snow, weird. Bookmark the permalink. ← Pretending to be a professional. I like it. Good humor and presentation. 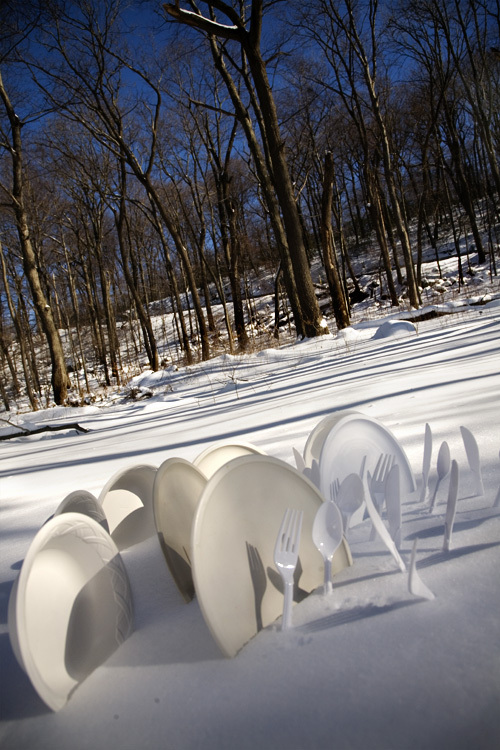 If you would have put some Hosta leaves on those plates, you would have had deer begging to come to your snowy picnic!